The Dexter Russell V-Lo line features a new state-of-the-art handle. The unique Dex-Tex Armadillo texture is soft to the touch but firm enough to handle all your cutting needs while still having a modern, attractive look. The stain-free, high-carbon steel blade is individually ground and honed to ultimate sharpness. Bread knives feature a sharp, serrated edge that glides through bread without crushing or shredding it. 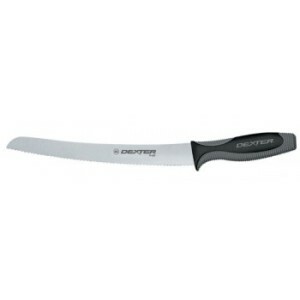 The Dexter Russell V-Lo 10″ Scalloped Bread Knife has a scalloped blade for effortless cutting.